Woo Hoo!!! So happy today is FRIDAY!!! I'm not going to lie, getting back into the swing of things this week after Spring Break has been a bit tough so the weekend is very welcomed. Today we are linking up with some of our favorite bloggers for Friday Favorites! I have lots of fun random favorites to share today. I usually buy 1-2 new pairs of shorts each spring/summer and I just got a pair that I am in LOVE with. It's no secret that we love leopard so when I saw these leopard shorts they caught my eye right away. J. Crew shorts are my favorite because they fit so well and their Factory site usually has some great deals. Well when these shorts went on sale for less than $30 I knew I had to order right away. They are made with a basketweave fabric that looks so nice and also helps them from wrinkling. They are definitely some of my new favorite shorts! 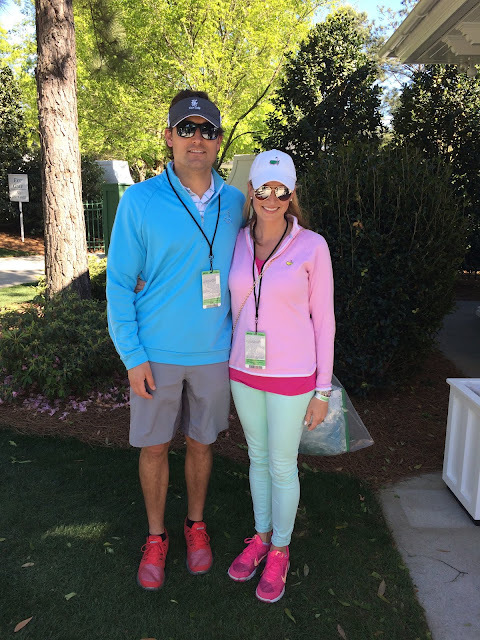 Last week on Spring Break, the Mr. and I had the wonderful opportunity to attend the Masters for a few days. It's my 3rd or 4th year going and I just LOVE it. The event itself is pretty amazing, the people are amazing, the grounds are amazing and I love getting to hang out with my favorite guy for uninterrupted amounts of time since no phones are allowed inside! Speaking of spring break...while we were at the Masters, the kiddos spent the week in Florida with their grandparents. I drove them down and on the ride back I was solo for the road trip meaning I got to listen to anything I wanted. 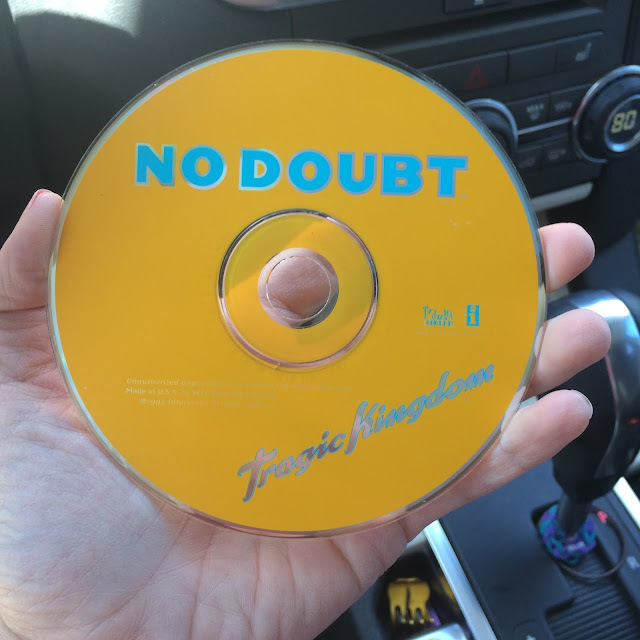 I threw it WAY back and listen to one of my all-time FAVORITE CD's, No Doubt - Tragic Kingdom. I used to love No Doubt and this CD. Isn't it funny how you can not hear a song for years and years and still be able to sing every word when you hear it? That is how I was for the entire CD and I was singing the whole way home. I still love Gwen Stefani and her new songs, too! Right after Spring Break we got to celebrate this little lady's real birthday. 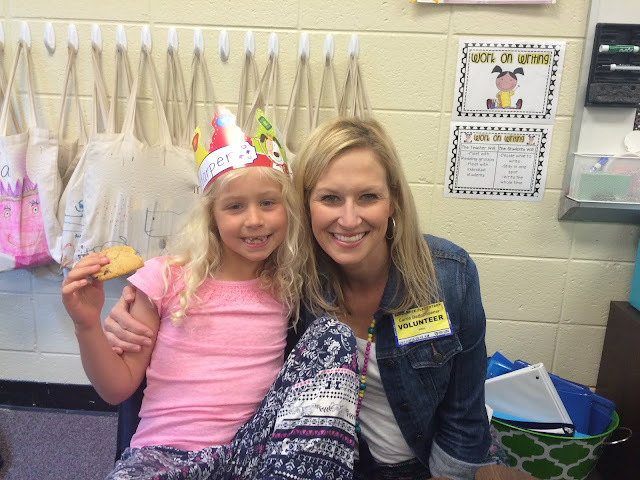 One of my favorite times from this week was getting to visit her class during her school birthday celebration. I took in cookies for her class and they all sang happy birthday after lunch. She loved sporting that birthday crown all day! Some of you may remember that we shared some of our spring favorites from our friends at Preppy & Personalized a few months ago. They have the cutest products and not too long ago I ordered this coordinates bar necklace. 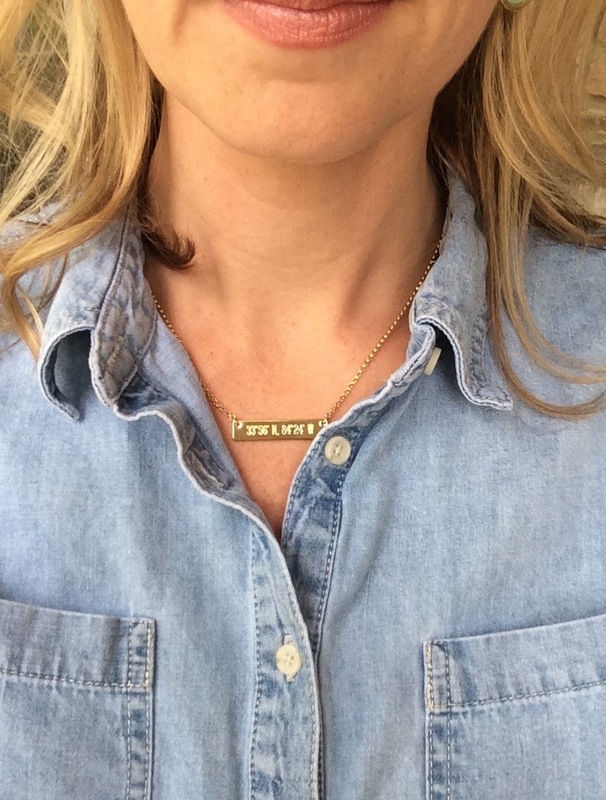 I'd been wanting a shorter style gold necklace to wear and loved that this one could be personalized with the coordinates of a place special to me. I love the length of the chain and it adds just a little when I don't want to wear a bigger statement necklace. This is just very dainty and personal. I think it would make a wonderful gift (maybe Mother's Day) and I'm sure it would become their favorites just like it became mine! In case you missed it yesterday, I shared my love of Matilda Jane with y'all. 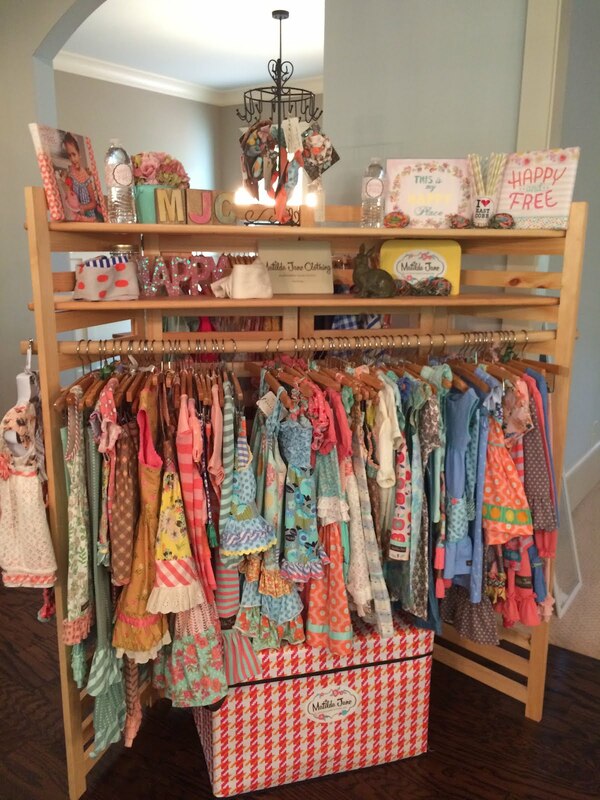 It is one of my very favorite clothing brands for my girls. Yesterday I had a trunk show at my house and it was SO much fun to be there with my friends checking out the latest release. So many adorable things!!! If you want to order on my show, there is still time. Directions on how to place an online order are HERE. Last, but not least I want to share my favorite sight as I walk out my front door each day. 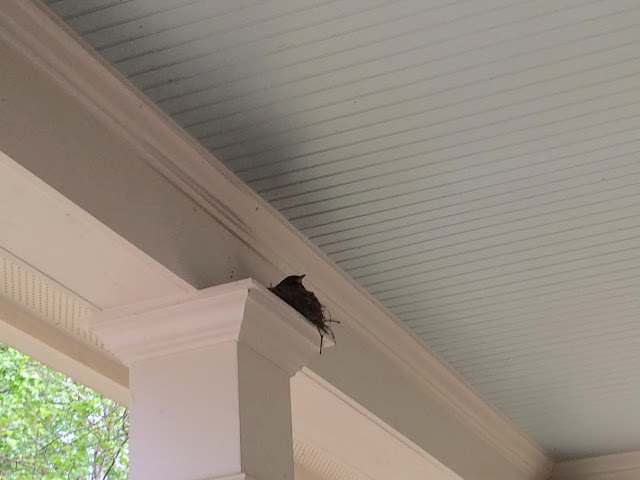 A bird had been building a nest on top of one of the columns on our front porch. I watched over the past few weeks as the nest grew, but I never actually saw the bird. This week though, the mama Robin has been sitting on her nest. She's usually there early in the mornings and in the evenings and during the night. I love peeking during the day to see if she is there and the kids have gotten a kick out of it, too! I can't wait to hear those baby birds chirping. :-) This obviously isn't a great picture, but I didn't want to get too close and scare her away. You can see the outline of her head and beak sitting on the nest though! 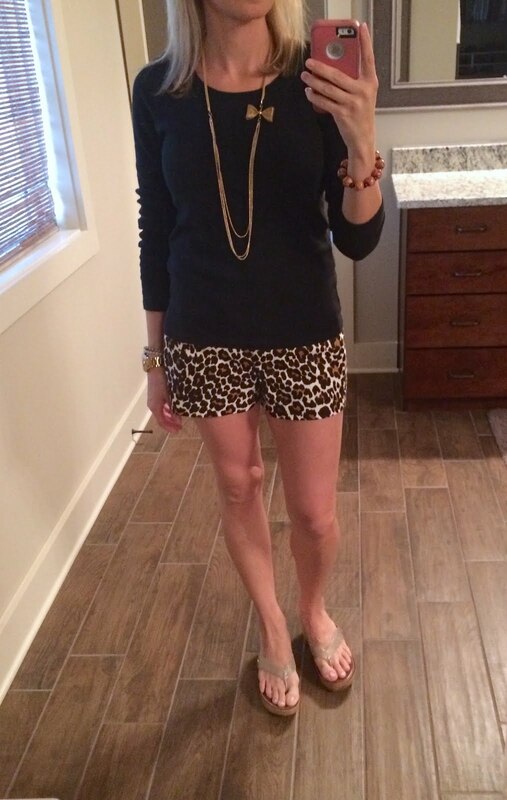 I haven't seen any leopard shorts before, but I love these. It sounds like she had a great birthday! They are so cute and way nicer than the regular factory shorts! Tragic Kimgdom!! Oh how that brings me back!! Those leopard shorts are so fun! J.Crew shorts are my favorite, they always fit just right. I'll have to find these!